After several years, the Avs could have another Slovak player on their roster. The Colorado Avalanche are very interested in picking Slovak defenseman Erik Cernak at this year's draft. Eurolanche.com had this information confirmed by a hockey coach in Slovakia. According to him, Cernak has been on the Avalanche’s radar the entire past season and even the team representatives attended several of his games in Slovakia. According to recent rankings, Cernak is supposed to be picked by some team around the 40th position. The Avs will pick their second pick of the draft exactly at that place. 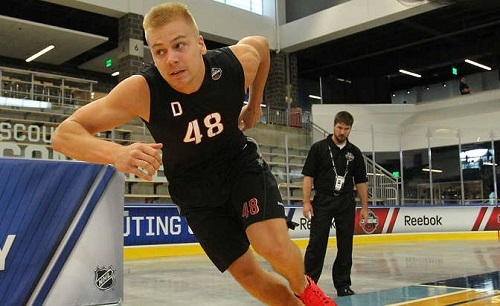 Erik Cernak was the only player from Slovakia to participate at the NHL Combine. This information was published by the Eurolanche Fan Club after last week's exclusive interview with Czech forward Pavel Zacha, who himself said that according to his agent, the Avalanche would like to pick him in the first round. If Colorado took a Czech player in the first round and a Slovak player in the following one, it would be tremendous news for all Czech and Slovak fans of the team. 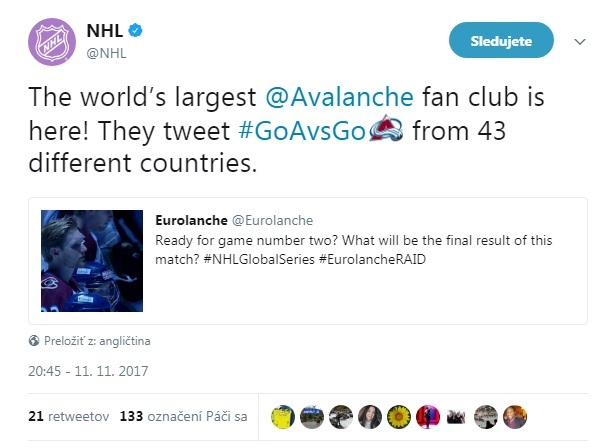 Eurolanche’s statistics say that the Avalanche has one of the strongest fan bases in the Czech Republic and Slovakia. Cernak played for Slovakia's junior team at the World Junior Championship in 2014 and was the youngest player at the tournament, being just 16 years old at the time. He became the youngest player to play for Team Slovakia at this level (surpassing forward Marian Gaborik). One year later, he was one of the leaders on the Slovak defense, contributing to his national team's second medal at the junior level in history – a third-place finish. Website eliteprospects.com writes this about Cernak: Huge, strong and has a long reach. Has very good experiences for his age. He is an impressive talent with solid physical play, Cernak shows brilliant defensive game and play in front of his own goalie. In his young age, he is perfectly suited for use in powerplay situations. He is a big defenseman, but doesn't spend a lot of time in the penalty box. Could improve his skating. Eurolanche did an interview with one of the biggest talents of Czech hockey in the past ten years. The Avalanche would like to pick him at the '15 draft.